Things are very quiet at BJ HQ, as my new job is taking up a lot of my time and most of my energy! Add to that the fact that this is the second week of the Easter holidays and you will understand that not much creativeness is happening here. 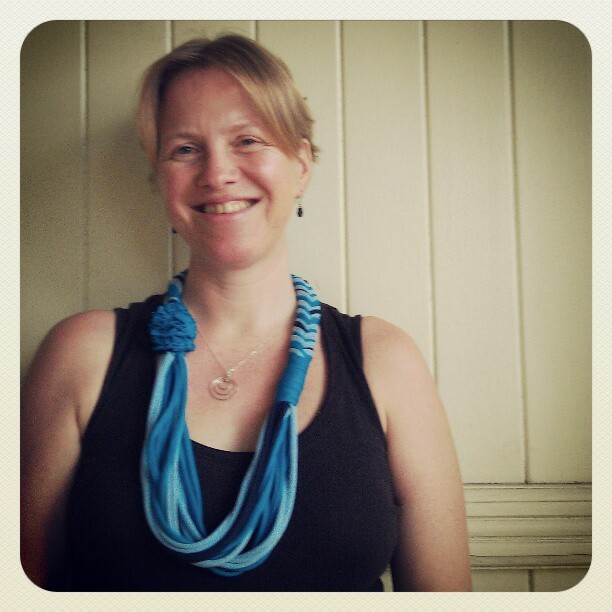 So I thought I’d show you my lovely new necklace – made by Kirrily of Moppety. She upcycles old t-shirts to create these beauties, how clever is that? This one was custom made in my favourite colours; aqua and blue. Thanks to my eldest son for taking the pic. If I look a bit tired you know why! This entry was posted in Shopping, Upcycling and tagged shopping on April 9, 2013 by bluejacarandadesign.